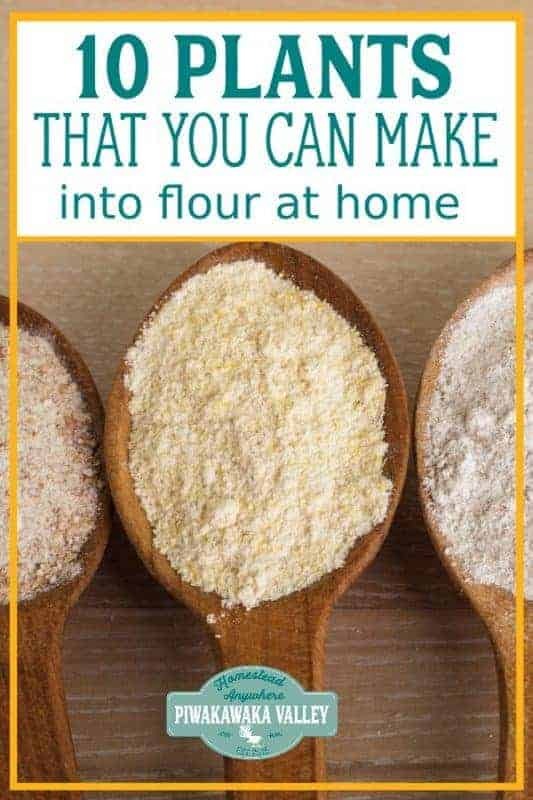 Whether you are gluten intolerant, or you simply cannot grow wheat where you are, there are several plant that you can grow and turn in to flour. 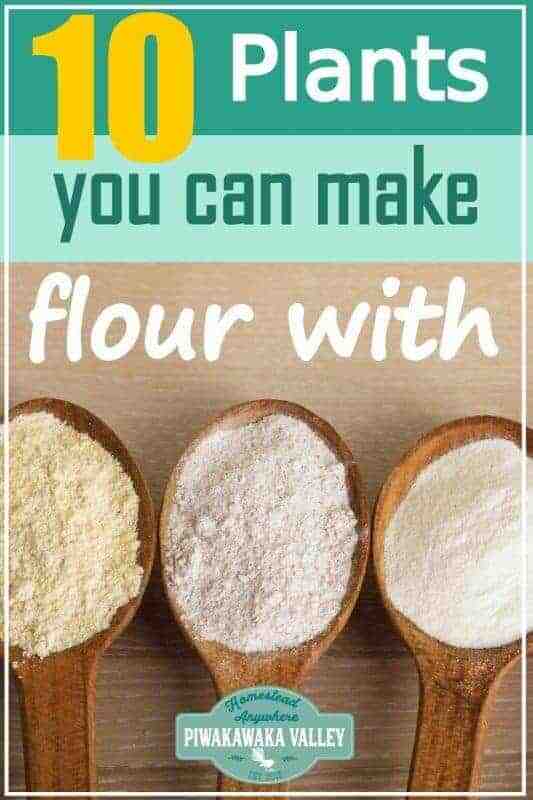 Wheat is not the only flour option, and with practice, you can learn to bake and cook with all sorts of different flours. Grains and seeds that don’t contain the gluten that wheat flour does, can be more difficult to work with. But follow these gluten free baking tips for better success. 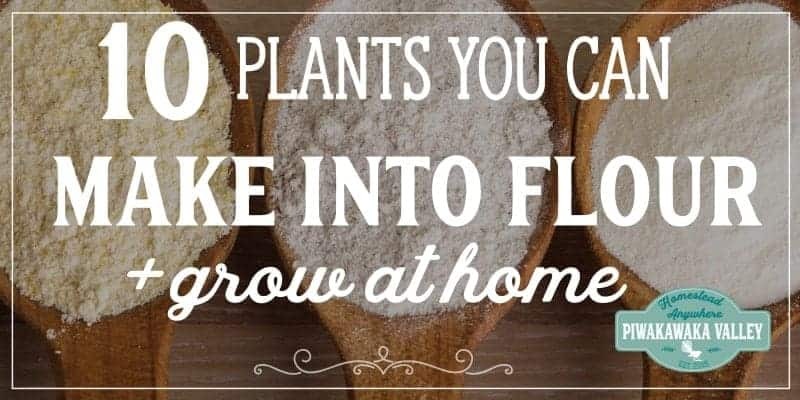 Some of these plants that you can turn in to flour might surprise you! Making flour at home does require a flour mill. These aren’t super cheap, but they do last well, and it usually works out cheaper to buy your own then to keep buying gourmet flours. Acorns are often spoken about as an emergency survival food, but they make a surprisingly delicious flour for everyday use. Acorns are easy to recognize and forage, and they’re abundant in many forests. Oak trees take a long time to grow, so if you want your own supply, you better get the trees in the ground last week! Unfortunately, acorns do take a while to process. They must be soaked for quite a while in water before they can be eaten to remove the tannins. It may be worth the trouble, though, for their good flavor and abundance of protein and healthy fats, and free-ness! Almonds require a warm climate, bountiful water, and take several years to reach maturity and produce. However, they are a favorite for those looking to eat more low-carb, gluten-free and raw foods. Almonds are full of protein and healthy fats and fairly easy to process into flour with a food processor. Amaranth is easy to grow in your backyard. It is heat and drought resistant and grows so well it’s often thought of as a weed in many places. The wild varieties are known as pigweed. Amaranth is high in protein and was bred and grown for flour by the Inca and Aztec people of south America. It does need to be winnowed to remove any chaff (plant material & hulls) after harvesting before processing into flour with a flour mill. Buckwheat is often used in the vegetable garden as a cover crop. It’s also one of the fastest growing seed crops and grows so fast it will smother weeds. It does well in extremely poor soil and is loved by honeybees and other pollinators. Although it is not related to wheat, buckwheat still makes a tasty and useful flour. It does require threshing and winnowing, just like wheat does, but it is actually a seed, not a grain! Nutritionally, buckwheat is high in protein and great for hungry homesteaders. Buckwheat flour pancakes are amazeballs. Also called garbanzo beans, chickpeas are another easy to grow nitrogen-fixing legumes. Chickpeas are quite productive and easy to make flour from, but they do prefer warm climates to grow in. Chickpea flour is a good source of vitamin B6, folate, magnesium, iron, and protein and common in Indian cuisine. Corn makes an excellent flour substitute. If you can grow sweet corn at your place, you can grow corn for flour. Flint and dent varieties of corn often thrive where wheat struggles and some are extremely drought resistant. They’re also easier to harvest and process than many other grains, though their flour doesn’t offer the protein that many seed and nut flours do. But hello Mexican food! When I was a child I was taught that dock was poisonous! But it turns out that it is totally edible. Curly dock is an easy to find wild plant that’s often foraged for its leaves. Much like plantain (the weed, not the banana), curly dock also offers an abundance of seeds which grow on tall spikes that can be ground into flour. Also like plantain, dock seeds don’t require winnowing and they are high in protein, making them a great option as a flour substitute. My girl’s birds LOVE millet! Millet has long been a staple crop and is known well for its ability to withstand drought conditions. It’s easy to grow but does require threshing and winnowing if you want to make a flour with it. Millet is high in protein and magnesium, and it acts as a prebiotic due to the soluble fibre it contains, feeding gut flora. Oats, though similar to wheat, is easier to grow and does not contain gluten. Growing oats is surprisingly easy and they are one of the few grains that can withstand rather cold climates, like the very top of Scotland. These days there are also hull-less varieties which produce less grain, but have a clear advantage in processing time. Quinoa can grow in your vegetable garden. It is the cool weather loving cousin of amaranth. Just like amaranth, it’s very easy to grow and offers a good high protein flour. If you are thinking ahead, and making preparations in case of SHTF scenarios, and you have the space, I would look at growing either oak or almonds, or both. Also it would be good to get in to the habit of growing some of the other seed or grain crops routeinly on your homestead. Preparedness is only useful if you know what to do with it, how to cook it and how to troubleshoot the crops BEFORE disaster strikes.